Today, I am sharing a favorite look of mine - pink and leopard. One of my favorite bloggers - Something Navy - that I regularly follow wore a similar look last fall. This past winter I even shared how to wear different shades of pink with leopard. If you want to try this pink/leopard combo - here are some cute pieces to re-create the look. This pink flounced hem top that is only $18 - and also comes in red. These skinny jeans that are 40% off. This black quilted bag that is only $25. These fun leopard platform slip on sneakers. I bought this sweater - and it is on sale for only $15! This gingham romper is only $31. This off the shoulder top in a fun lemon print that is only $15. This palm print one piece suit is only $11. I am not sure about about palazzo pants - but this lemon colored pair (or print version) is kind of cool. This straw tote (with a zipper) is only $18. This store has really upped its game - with this palm print one piece suit. This linen sleeveless stripe shirt dress looks perfect for summer. If you like two piece suits, this palm print two piece is only $15. This cute striped off the shoulder dress is only $36. These palm print embroidered cut off shorts are marked down 40%. 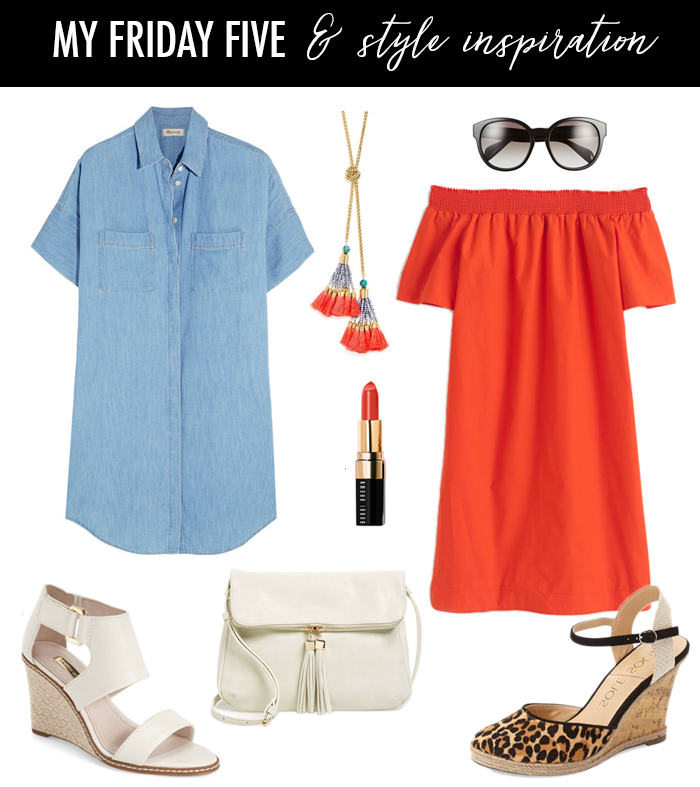 Also, my friends at The Blended Blog are hosting a fashion link up today - so be sure to link up. Oh, I am embarrassed- somehow I managed to spell "summer" incorrectly in my post title over the weekend, and by the time I had noticed, I had linked up with other blogs - so I just left it, as is. Do you ever have that happen? 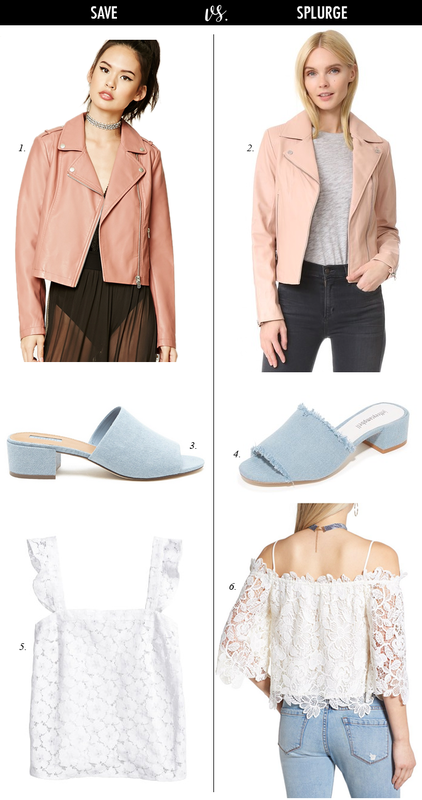 Nordstrom is having a great sale that ends June 4th - so here are just a few more of my picks. 1. This is the perfect summer top - and it is only $36. 2. This cute pleated peplum tee is only $41 - and comes in three colors. 3. This pendant necklace is under $10. 4. These chandelier earrings are marked down 40% - and come in three colors. 5. This chambray off the shoulder top is marked down 40%. 6. This velvet clutch is only $17. 7. This cute layered star & moon necklace is marked down 40%. 8. These sneakers are on sale and under $50. 9. This fun tote is only $13. 10. These on trend perforated oxfords are only $42. 11. This flat cut-out sandal is only $45. 12. I love leopard - and I just might order this skirt that is only $27. 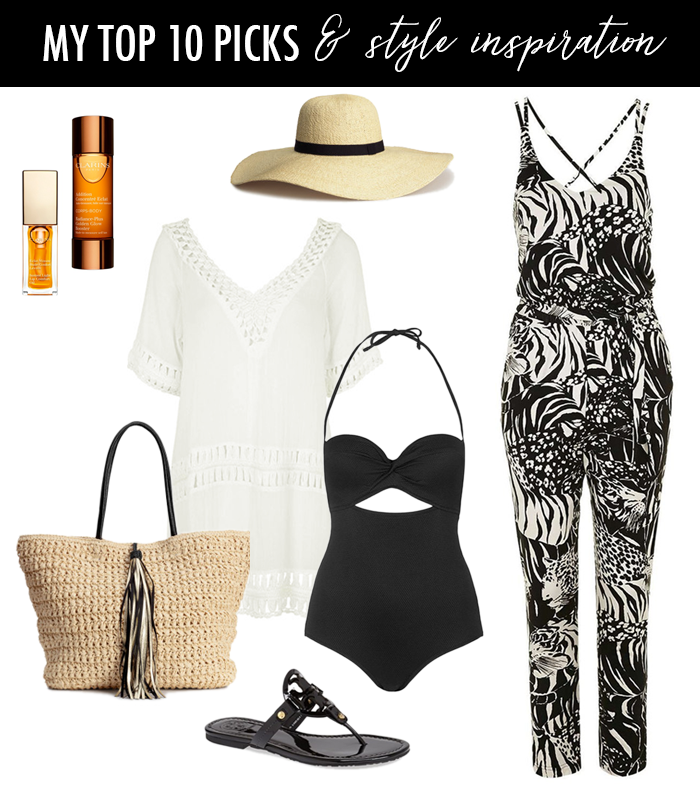 Just in case you missed it - I shared more of my top 10 Nordstrom picks here. There are some great sales this Memorial Day weekend! 1. This dress is just perfect for summer and it is 30% off. 2. I bought this pleated skirt - it was 40% off and I thought it would be perfect for summer & work. 3. This striped cap sleeve sweater is 40% off and only $30 on sale. 4. 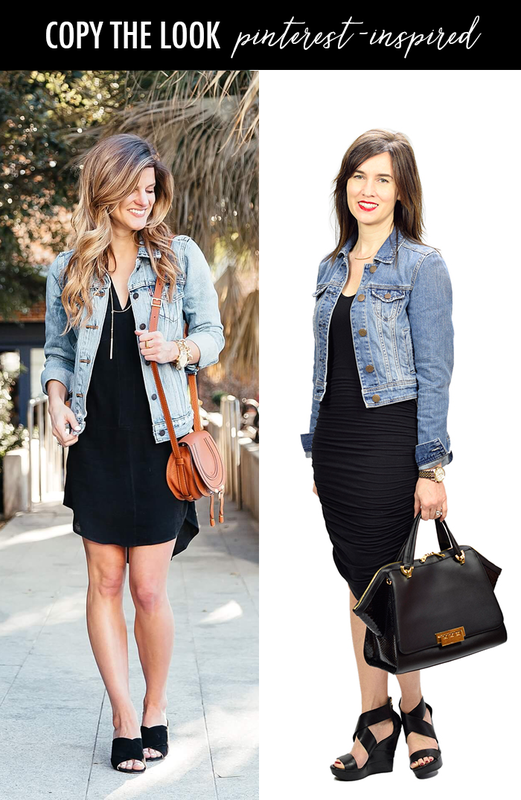 This denim jacket is on sale for under $20 - and it comes in both a light and dark wash.
5. This white off the shoulder ruffle dress is on sale for under $50. 6. This leopard skirt (that also comes in black and floral) is only $8! 7. These espadrille wedge sandals are on sale for $30. 8. This lace dress is 40% off and under $35. 9. This Kendra Scott-like necklace is on sale for $12. 10. 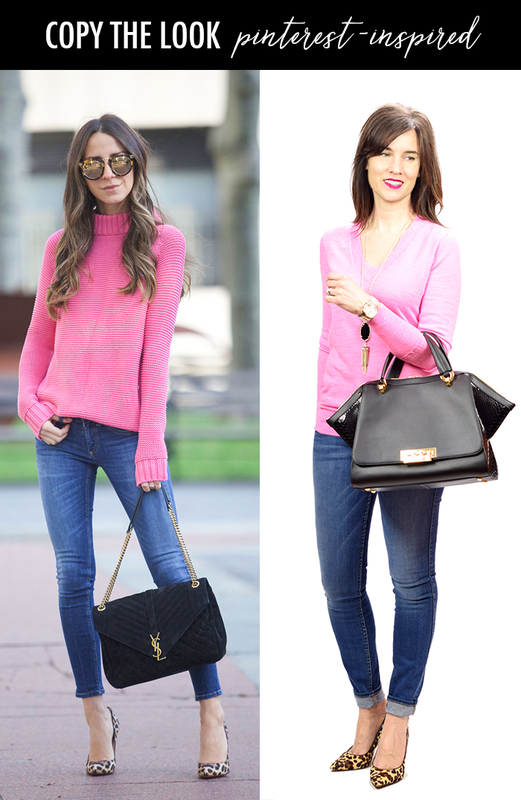 These skinny jeans that come in four different spring colors are 40% off and only $42 on sale. 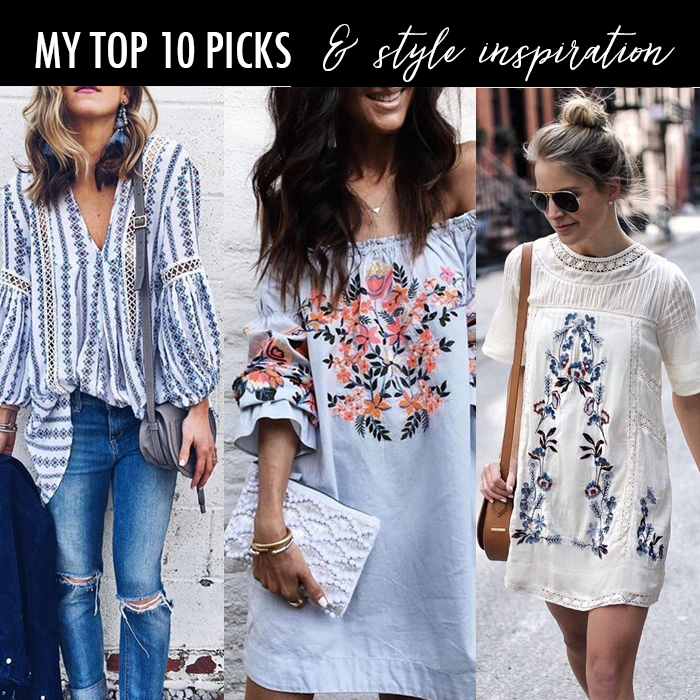 Just in case you missed it - I shared more top 10 picks yesterday + my top 10 Nordstrom picks here. 1. This popular Rebecca Minkoff crossbody bag is 40% off - and comes in this great grey color. 2. This striped tee is on sale for $10. 3. These lightweight cardigans are my favorite - and they are 40% off. 4. This short sleeve utility blouse comes in this awesome honey brown color - and it is 30% off. 5. This cute embroidered gingham top that is 30% off. 6. This simple tee is on sale for $5 - and comes in different colors and stripes. 7. MAC is one of my favorite lipsticks - and this liner and lipstick set is 15% off. 8. This really fun pineapple blouse that is 30% off. 9. This cardigan would be the perfect layering piece for cool summer nights - and it is 40% off. 10. These jeans are on sale for $15. 11. I had my 10 items picked - but then I found this dip-dye sweatshirt that I just wanted to share. 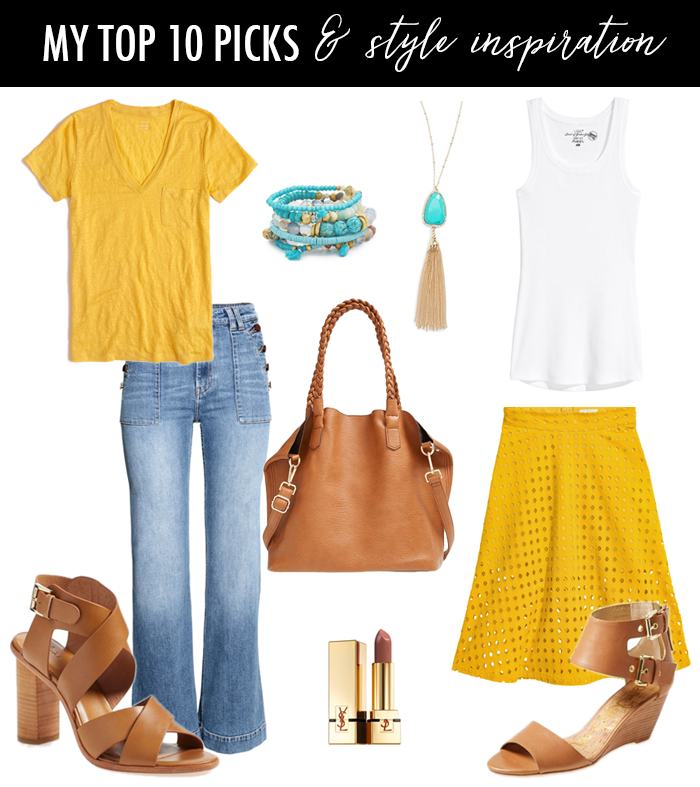 Just in case you missed it - I shared my top 10 Nordstrom picks here. 1. This perfect for summer maxi dress. 2. This $20 ruffle blouse that comes in two colors. 3. This cute striped sleeveless shirt with a bow. 4. This white wrap dress. 5. This perfect summer sundress. Also, it is Nordstrom's half yearly sale - and I shared my top 10 picks. The Nordstrom half-yearly sale is going on right now and there are some great deals. Here are just a few of my picks. This satin ruffle blouse is only $21. This cute gingham sweatshirt is 40% off and on sale for $30. I love these blush suede chunky heeled sandals. This striped tee is 40% off and under $20. This cute rose colored off the shoulder top is $20. This basic pocket tee is on sale for $17. This maxi dress is 50% off. I like this ruched dress that is 40% off. My favorite (and most comforable) sandals are marked down 30%. I think this embroidered sundress would make the perfect cover-up and it is only $31. LOFT is having 40% off everything - a few picks are this embroidered tassel top or this cute flutter sweater or this striped dress with puffed sleeves. And, I just spotted these crossover red slides that are on sale for $42. They also come in black. 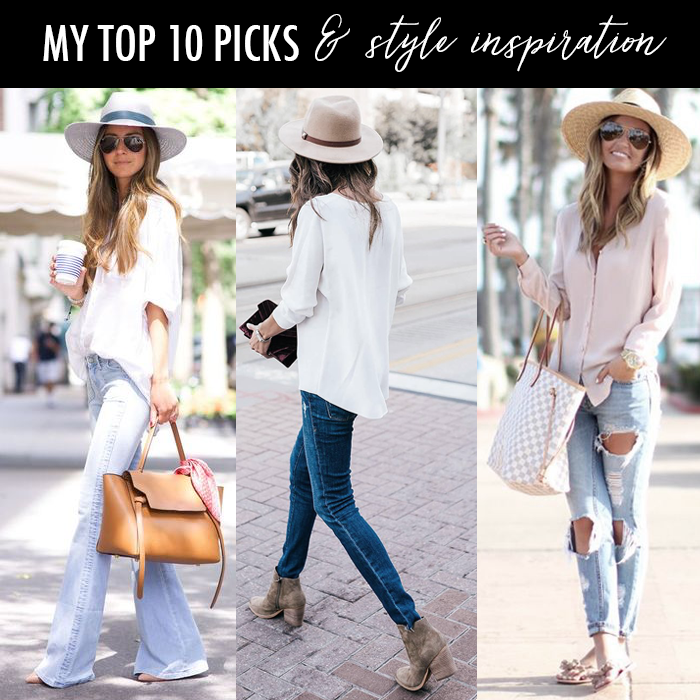 How to wear white jeans is a pretty popular "pin" on Pinterest - and I think styling white jeans with a denim jacket is a pretty classic look. I hesitated including this photo of Caitlin because I read that she is frustrated by others monetizing her own personal creations (outfits); however, I actually posted this white look with a denim jacket a few months before she did - so I feel pretty safe sharing it - as my own look. These peach Converse sneakers are only $33. This is the cutest pleated peplum tee - in classic black and white - and it is 30% off. These classic white adidas sneakers are marked down 20%. These skinny cropped jeans - that come in great spring/summer colors are on sale! These are the cutest baseball sneakers and they are on sale up to 25% - if you are baseball fan - you will love these! This petal sleeve striped blouse is so pretty. This is a cute eyelet sundress - that comes in a perfect bold yellow and also classic black and white. And, it is under $25. Just in case you missed it - yesterday, I shared all my pineapple finds & deals. 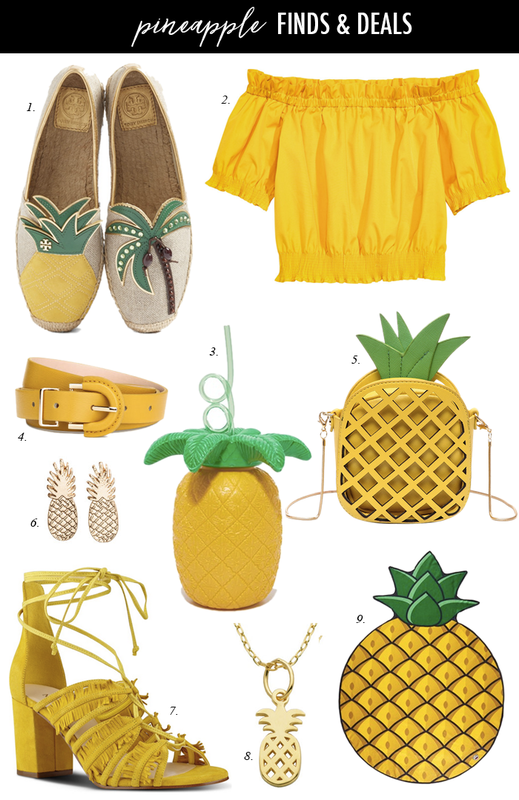 There are so many fun pineapple things right now. I just came across these pineapple beach blankets, sipper cups, and ice cube trays. This cute embellished pineapple skirt. This fun pineapple phone case. This cute gold pineapple key chain that is only $5. This fun embroidered striped cover up. This fun nautical inspired midi length cover up - that could also be worn as a dress. This sleeveless striped shirt with a fun bow. This gingham off the shoulder top would be the perfect summer top. This floral lace dress is on major sale! This striped tee comes in three colors and is only $17. This red hot off the shoulder dress (also comes in black). This carry all stylish black backpack under $50. These trendy reflective aviator glasses that are only $12. This perfect tote for traveling - that has the cutest lining and three easy to access compartments. A summer dress style inspiration... Details about all the pieces in the original post here. 1. These very popular flip flops that are still on sale. 2. This very versatile white blazer that is on sale. 3. This canvas tote that comes in different colors and sayings is under $30. 4. This sleeveless sweater that is on trend this summer. 5. This cute crinkle dress that could be worn as a dress or cover up. 1. This cute white wrap dress that is under $50. 2. This simple jersey dress that comes in black and red and is only $18. 3. I love this cute sundress - and the color. 4. This one shoulder yellow floral sundress is only $17. 5. This maxi dress would be the perfect summer dress. This is one of my favorite brands and these woven chunky heel sandals are marked down 25%. This cute floral sundress that is on sale for as low as $15. This fun zebra print skirt that is under $25. This pretty off the shoulder top (with thin straps) comes in the perfect floral print. 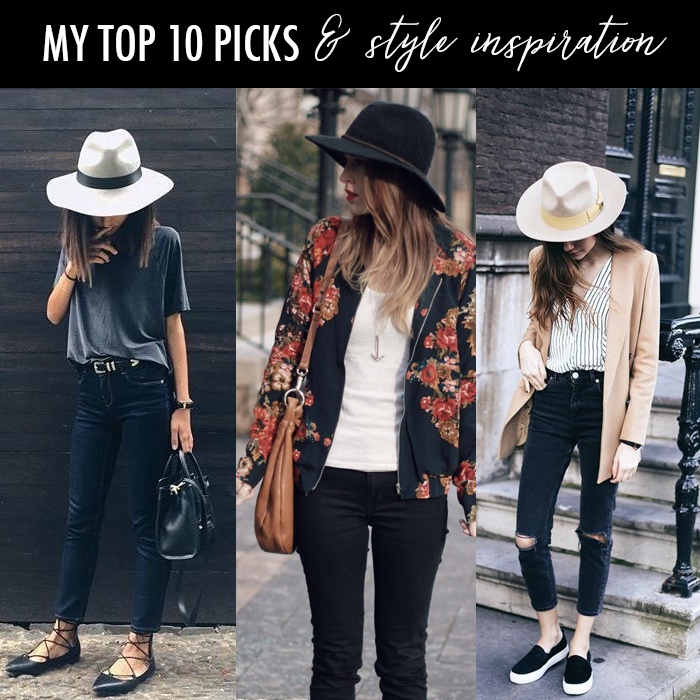 I found this fedora that is only $18 - and I starting looking around for some style inspiration for today's post, I came across all these great looks for how to wear a fedora or floppy hat. I think everyone always looks so stylish - yet I feel a little unsure about wearing one. Also, I never know when you wear it - and when you should take it off. Do you take it off in a restaurant - and if you are sitting outside - do you keep it on? I am sure the rules have evolved - but what are today's rules to follow? I have pinned these images to my Pinterest board. 1. This fun lace up tee - comes in stripes and four colors - and is on sale for as low as $14. 2. This pretty blush tunic is 33% off - and it also comes in seven other colors. 3. I have been looking for a sleeveless summer sweater - and I found this one that comes in the best colors - and is up to 40% off. 4. I love this lilac suit jacket - I think it would look great paired with jeans. 5. My favorite (and most comfortable) slides are still marked down 30%. 6. I can’t believe this floral tank is as low as $11. 7. The cutest palm tee sneakers or they come in a flag version would be cute for Memorial Day (or Fourth of July). 8. I love my camo jeans - and wear them more often than I ever thought I would. These are 40% off. 9. This pretty linen dress is a bargain for as low as $11. 10. This one shoulder ruffle dress reminds me of the dancing emoji - and it is on sale with an additional 30% off. Rebecca Minkoff is having a huge sample sale - and there are some amazing deals, like this popular bag. As you maybe starting to pack or think about a beach vacation - here are some ideas on what to wear. 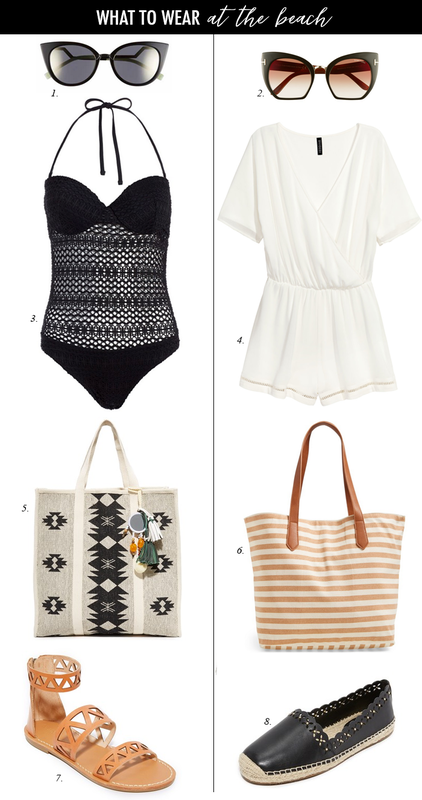 The romper on the right (that is under $30) could easily be worn as a fun cover-up to the one piece suit on the left. My friend Whitney recently asked for some style inspiration for how to wear the embroidered trends. I shared a couple of outfit ideas in the last couple of months - one of them happened to be one of my favorite style boards. I shared how to style an embroidered moto jacket in this post, and how to wear an embroidered bomber jacket (with these really fun red loafers that are under $60) in this post. 1. I recently spotted this embroidered sweater - it is not something I typically would like but I do. 2. This is a cute embroidery chambray romper. 3. This striped casual applique sundress is only $42. 4. This fun summer dress with tassels is 30-40% off. 5. This floral straw tote is on sale for as low as $39. 7. I have seen this off the shoulder dress styled - and it is stunning. It comes in classic black and a bold red - and it is on sale for $22! Happy Sunday! 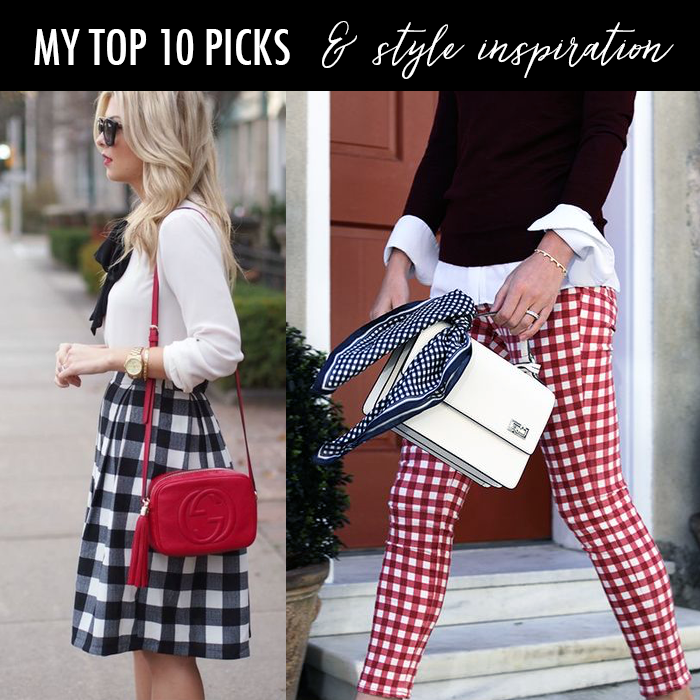 Some more summer plaid style inspiration that I have pinned to my Pinterest board. 3. This bold gingham asymmetrical - one shoulder top is classic and would make a statement. 4. This is a pretty floral (and black) maxi dress that is under $50 - and would be a perfect summer dress to wear to a wedding. 5. This fun off the shoulder plaid top (that has lace details) is marked down to under $18. 6. This initial necklace is marked down under $15. 8. I have shared these before - but these stud earrings that come as a set of 2 are only $10 (and there are 7 different color combos to choose from). 9. This is one of my favorite brands of jewelry (because of the quality) - and this set of 3 rings is marked down to $18. 10. I like these tie front tees. 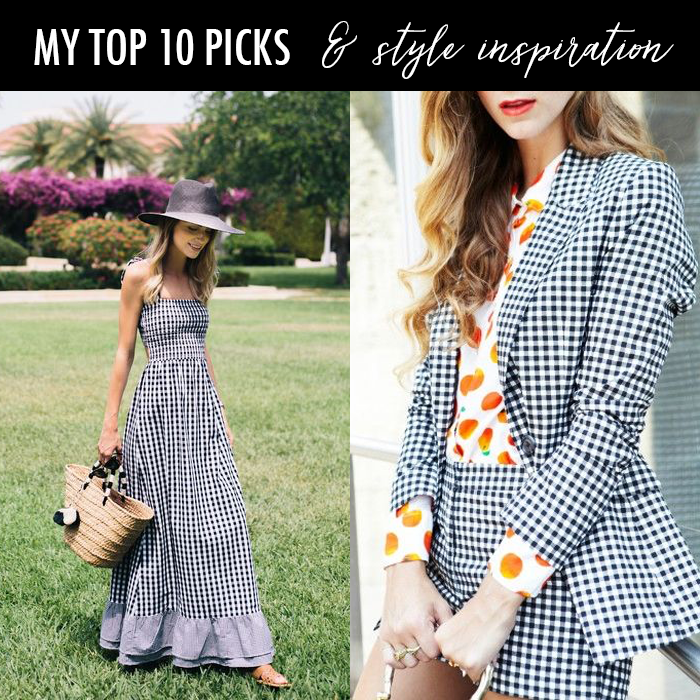 Just in case you missed my top 10 picks yesterday (with cute gingham clothes) and my top five most popular items & top five summer sweaters on Friday. 1. This shorter pleated skirt - looks great with a denim jacket - and is on sale for under $30. 2. These palm leaf pants look so comfy and are only $18. 3. I still like these $20 woven (and metallic) sandals. 4. This is the cutest off white bomber jacket that is gathered at the bottom. I noticed it online - and right way I went search to find out more about it - it is that cute! 5. 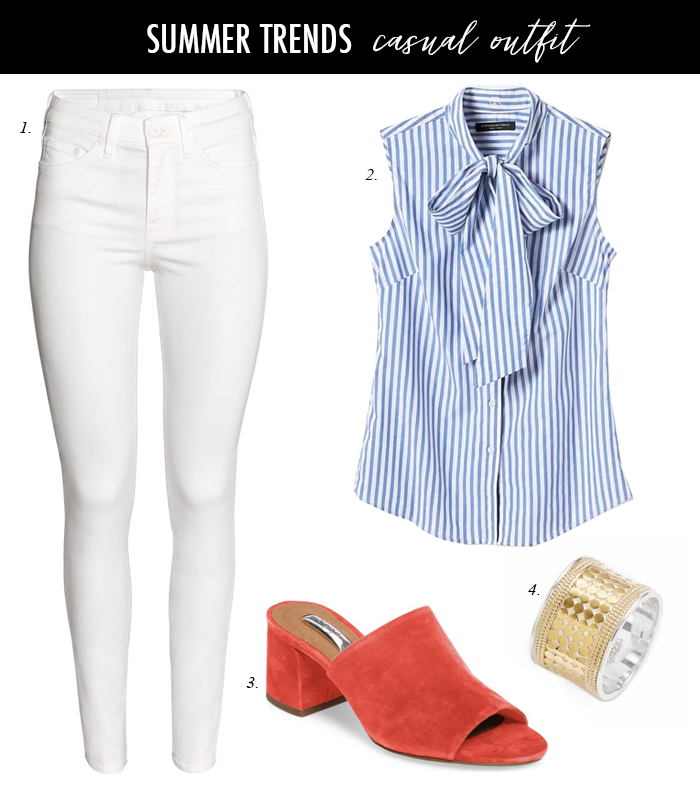 A more business professional striped ruffle top that is not off the shoulder - but still fun. 6. I love these bold yellow ankle pants (that also come in more neutral colors, too). and are as low as $20. 7. This dressy biker jacket - would be the perfect dinner outfit. 8. This lacy off the shoulder blouse with gathered bell sleeve - is a great price! 9. This is a great easy, breezy swing dress that comes in the three best colors. 10. A pretty in pink layered chiffon blouse that is under $30. 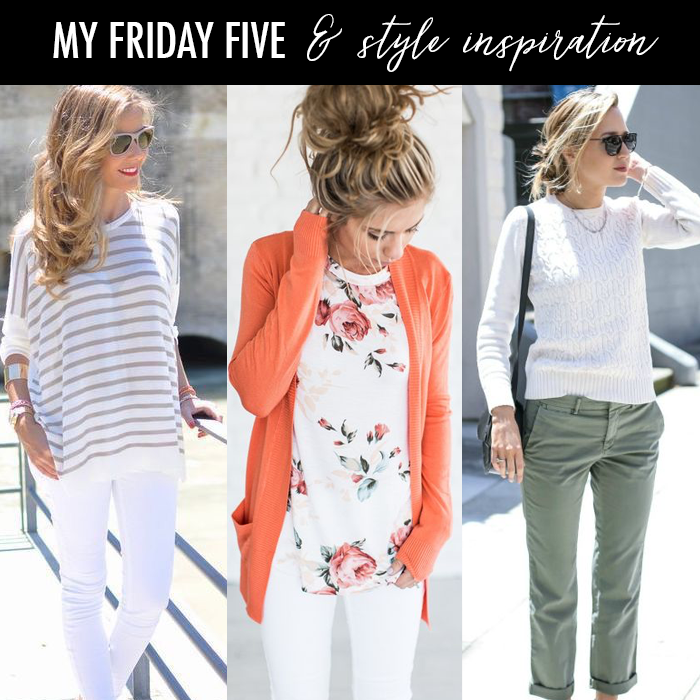 Yesterday, I shared my top five summer sweaters and top five most popular items, along with some cute summer style inspiration. Also, Macy's is having its Friends & Family sale - 30% off almost everything. I will probably pick up my favorite beauty product and I am looking for new luggage, like this one. This cute eyelet dress - that comes in the most perfect color. A simple, yet classic maxi dress that is under $25. Probably my most favorite (and comfy) sandal of all time. A lightweight and one of my favorite cardigans. 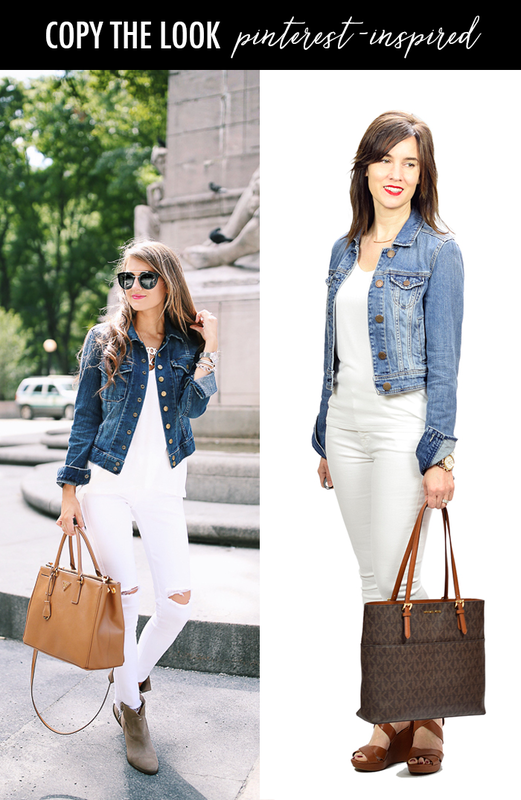 A classic denim jacket that is under $35. And, you need the right shade (and fading) - and this one is just perfect. A sub tee shirt sweater that comes in six different colors - and is $20 on sale! This sweater is like a mix between a sleeveless vest and long cardigan - and it is under $25. I love this bat-wing boatneck sweater. 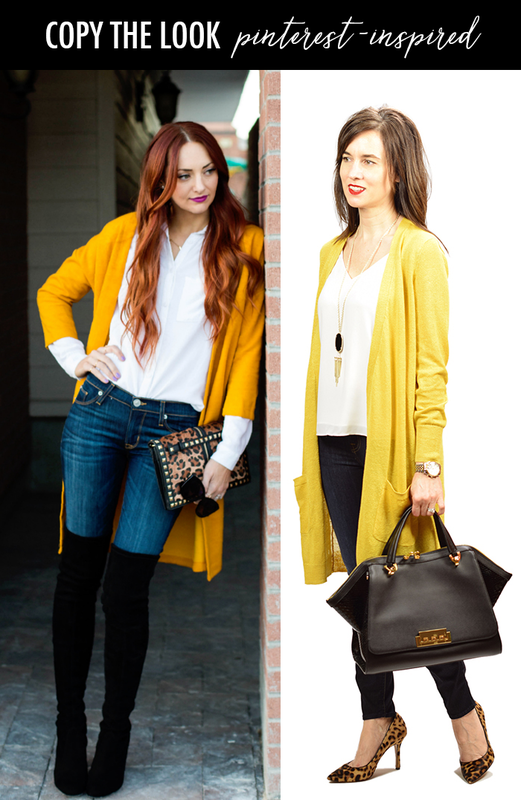 This cardigan comes in 7 colors - and is only $13. 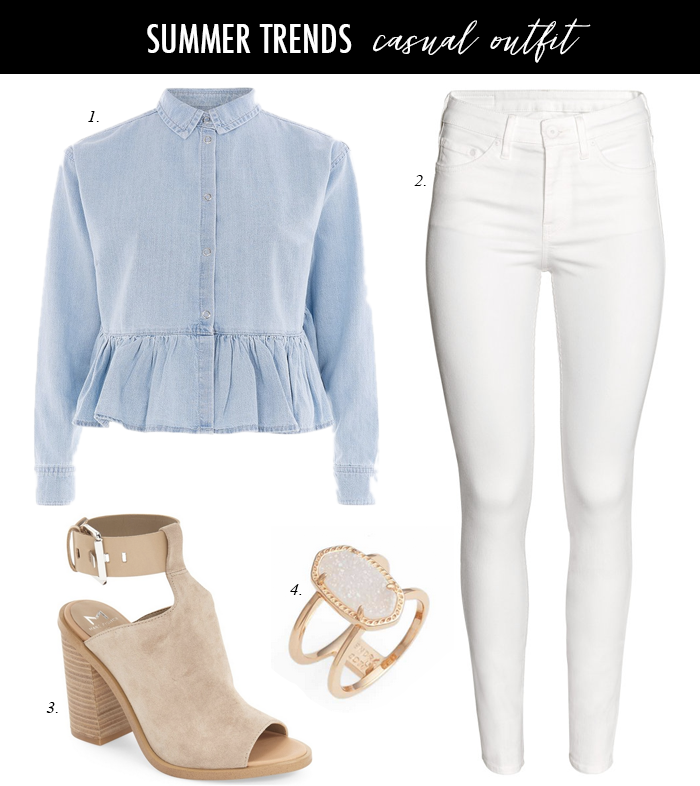 If someone would ask me three big trends you need this summer - first, I would probably say a moto jacket (for layering over pretty much any look - for both practical (to stay warm) and stylish reasons (to look "cool"), next, would be a pair of mules (like these denim ones that are under $25), and lastly, a lace top (this tank option is under $25). I probably should not admit it - but I own more than one moto jacket. I am typically cold most of the time, so a leather jacket is a stylish way for me to add an extra layer of warmth - while still looking trendy. This one that I am sharing above is only $20 - and I have to say, I have been pretty impressed with the quality of their faux leather jackets in the past. 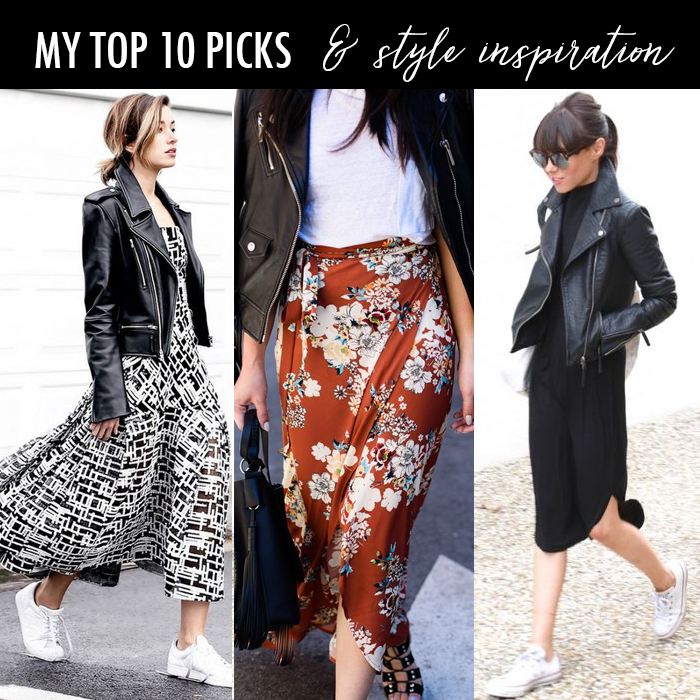 My friends over at The Blended Blog have started a new Wednesday fashion series - showing how our look was inspired by Pinterest. 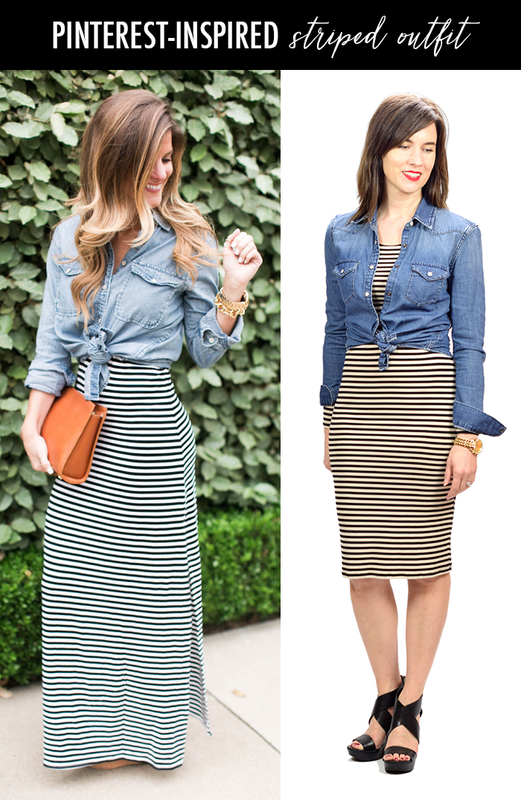 Today, I am sharing how Brighton's striped dress and denim shirt look inspired my outfit. The dress I am wearing - I picked up at Forever 21 for $11 on a whim. I was quickly walking through the store - and spotted the dress - and bought it. I didn't even try it on. I figured for $11 - if it didn't work - it wouldn't be a huge loss - and it was worth skipping the hassle of trying it on. (Do you ever feel that way?) Lucky for me - it worked out perfectly. I have worn the dress several times - and I look forward to wearing it again this summer. 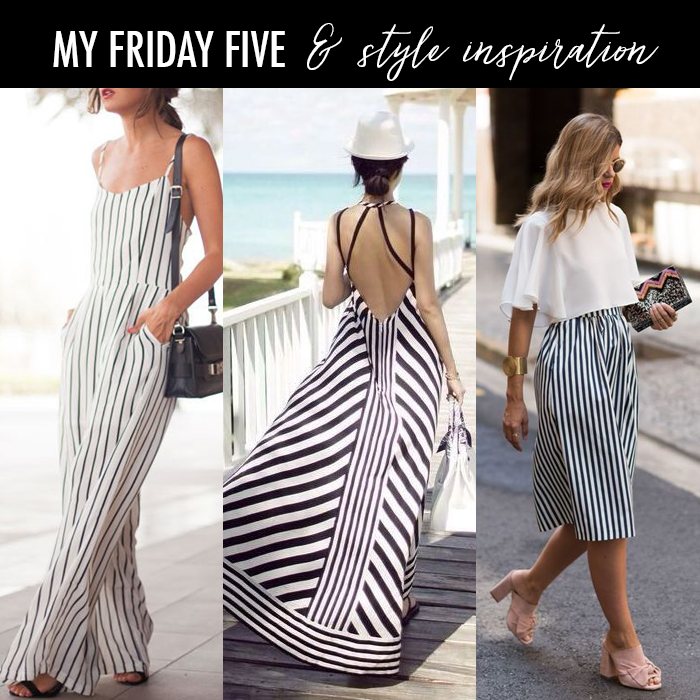 I shared another way to wear a striped dress with a cargo vest (also inspired by Pinterest) - and it is one of most popular posts. 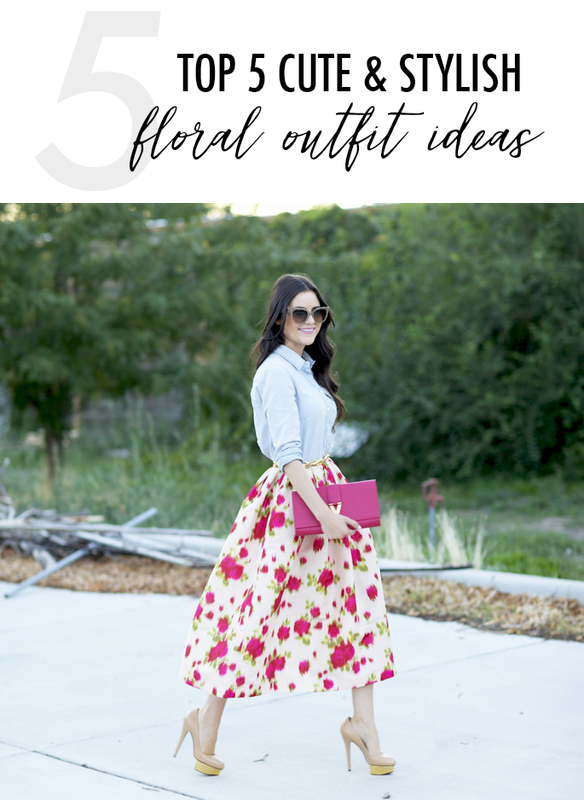 When I think about a floral spring look, this look and floral Michael Kors skirt from a few years ago is one that always stands out in my mind. That skirt made an impact, and I love the mixing of the "casual" denim shirt with the dressy skirt. This floral skirt from Rachel's collection is a perfect match to re-create the look, and this chambray shirt is under $25. I re-created this look a few weeks ago. I love the mixing of a red floral dress with the cargo vest. I found this cargo vest that comes in several colors and is under $35. And, if you like that red dress - it also comes in white version with black detailing. I love the look of a white blazer layered over the floral dress. I picked up this white blazer a couple of weeks ago - and I love it. I get compliments when I wear it. 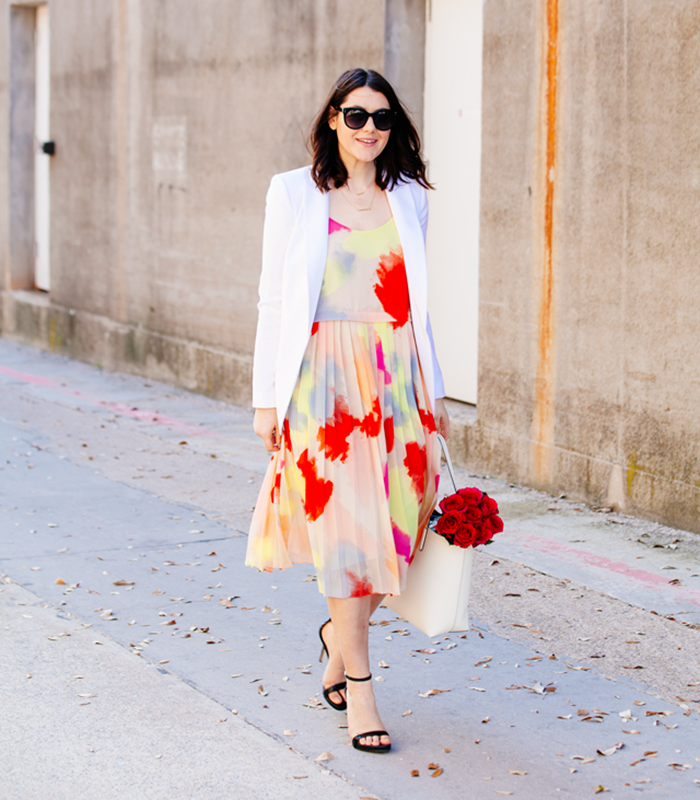 This floral dress with a pleated skirt would look cute layered under a blazer. Floral joggers are a great way to look both dressed up and comfy casual at the same time. I found these joggers that are on sale for only $40. And, I shared my top five picks for denim jackets under $50 here. This is the perfect summer outfit. I found this cold shoulder floral romper and this racer back romper for under $40. 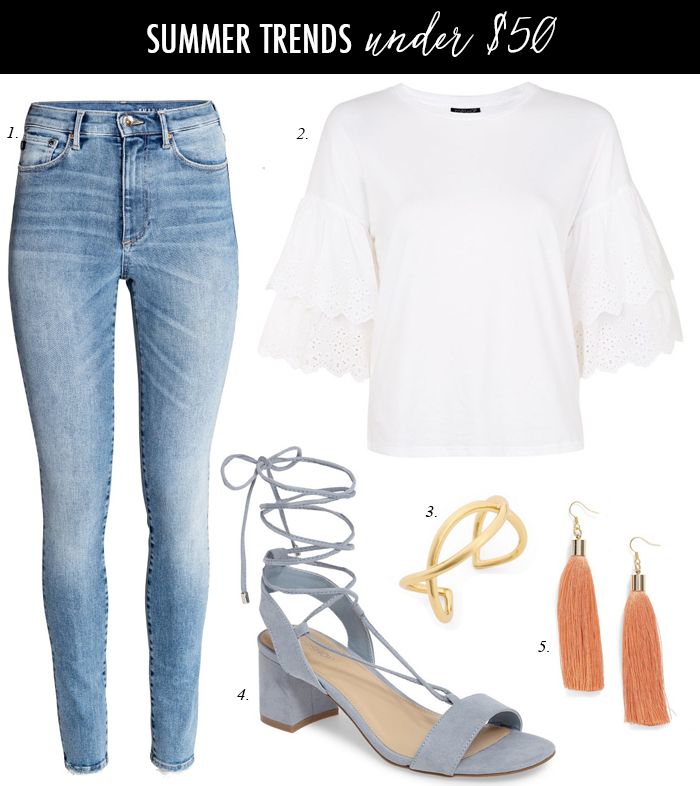 And, paired with my favorite chunky heeled lace up sandals that are under $50. 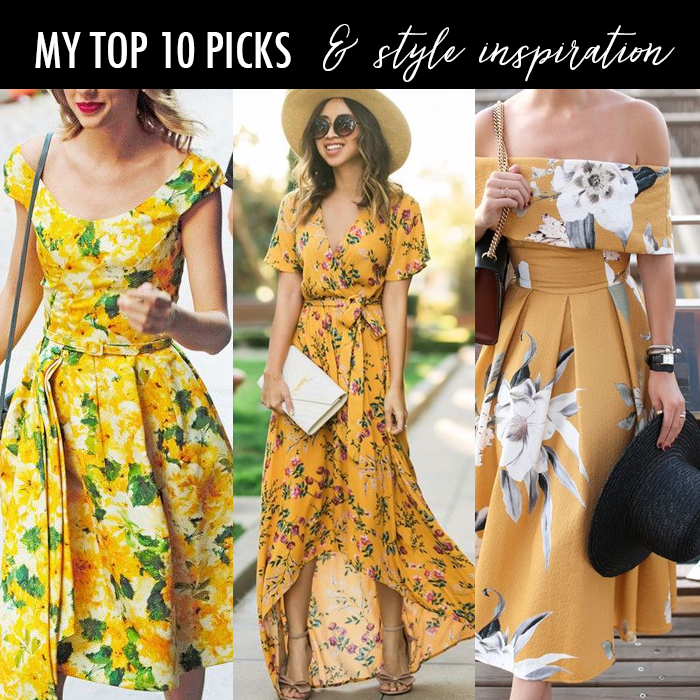 Today, I am sharing my favorite floral looks as part of a blog hop with my friends at The Blended Blog. 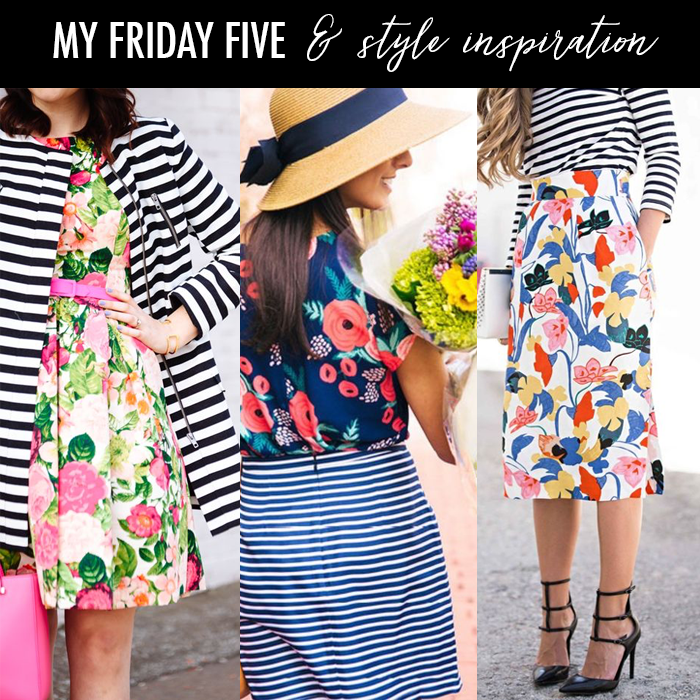 Next, be sure to hop over to Carrie's Blog, A Stylish Fit, to see what pretty floral things she is sharing. And, be sure to link up your favorite pretty floral things.